"It’s a smack in the face. It’s disrespectful and ignorant," said the sister of a Philadelphia police officer who was killed in the line of duty, after learning the men accused would accept a plea deal. The family of slain Philadelphia Police Sgt. Robert Wilson III got a call from the district attorney's office late Friday telling them that the men implicated in his murder will not stand trial or face the death penalty. Law enforcement sources told NBC10 late Friday that Carlton Hipps and Ramone Williams plan to accept life sentences plus 50 to 100 consecutive years in prison in exchange for guilty pleas in the March 2015 murder. Hipps and Williams will formally accept the deal at Philadelphia's Criminal Justice Center on Monday morning, sources said. Ben Waxman, the DA office's communications director, said, "This is a pending case, so we have no comment at this time." Shaki'ra Wilson-Burroughs, sister of slain Philadelphia Police Sgt. Robert Wilson III, said she was left speechless when she learned Friday afternoon that the men accused of killing her brother were given plea deals to avoid the death penalty. She has strong words for District Attorney Larry Krasner. An email to defense attorney Michael Coard — who previously worked on Krasner's transition team — was not immediately returned. The plea decision has upset Wilson's family. 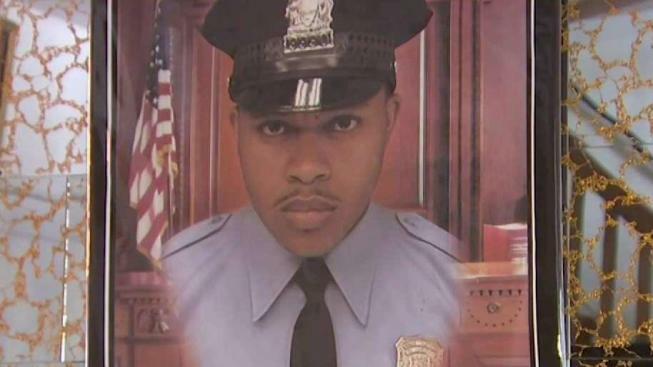 They feel justice isn't being served for an officer who lost his life thwarting a robbery inside a North Philadelphia Gamestop. Wilson, who visited the store on a lunch break to buy his son a birthday gift, diverted gunfire away from staff while engaging the robbers in a shootout. Wilson's sister, Shaki'ra Wilson-Burroughs, said she was speechless when she got the call Friday afternoon about the plea deals. "They failed my brother," Wilson-Burroughs said. Since he took office this winter, Philadelphia District Attorney Larry Krasner has faced criticism from families whose loved ones were killed. The families said they're worried justice won't be served, citing Krasner's policies on criminal justice reform. During his campaign for the office, Krasner had pledged to never seek the death penalty. He also expressed his personal objection to capital punishment. In March, Krasner told NBC10 that the case remained a capital one at that time. He said he would follow the decision of a committee that would convene to determine the appropriate sentence in this case. Wilson-Burroughs said she was told the committee met for two hours this week, but their decision was not shared with the family. "No one even got a statement from us to even present," she said adding that the family has been shut out of the process. "Everything is hush-hush. It feels as though the district attorney's hand is covering their mouth," she said. John McNesby, president of the Fraternal Order of Police Lodge 5 and a longtime critic of Krasner, was disappointed by the decision. "The message to Philadelphia Police officers: Be careful because you don't have the support from the Philadelphia District Attorney's Office," he said. Friday's deal comes nearly three months after Wilson-Borroughs and her grandmother, Connie Wilson, first shared frustrations about delays in bringing Hipps and Williams to trial. Three years came and went without a trial. Then, this spring, a new delay. March 6, 2015: Brothers Carlton Hipps, 30 and Ramone Williams, 26, are charged with murder in the killing of Philadelphia Police Officer Robin Wilson III. Photo credit: Philadelphia Police Dept. "They had all the evidence for Robbie's trial. They had the gun. They had the murderers. They had the [surveillance] tapes. They had the store where they went in and killed him. All this they had. They were ready to go to trial, no sooner than [Krasner] gets in [to office] things back up. Why?" Wilson's grandmother, Connie Wilson, said in March. At that time, both women called for Krasner to step aside from the case. Wilson-Burroughs had a more direct demand for Krasner Friday night: "Do your job." "How about stand up as a man, pass off [the case] and say what you cannot do since you can't hold this case and be fair." CORRECTION: This story has been updated to correctly reflect Krasner's comments about the Wilson case in April.